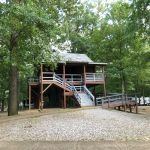 Ask fellow campers about "LeFleurs Bluff State Park" and nearby attractions. Nice quiet, off the beaten path, next to Jackson. Dump on way out, handy. We camped at LeFleurs Bluff State Park in a Motorhome. A park full of contrasts - rough roads to enter, horrible pads to park on, and yet beautiful scenery with egrets on the lakes in the park. The pedestal plug was loose and looked very "used". As noted, entry / exit codes required to operate the gate. With all the services elevated, they must have severe floods at times, so stay situationally aware if the weather changes. We might stay here again because of the location. Surprised by the amount of road noise this morning. Our site, 14, could not contain our RV on a level surface. Could not back up because of a large concrete "stop" that would have sheared the rear jacks. Front wheels were at least 6 feet in front of the pad, and were on a upward slant. We camped at LeFleurs Bluff State Park in a Motorhome. Almost too small for our 37 ft motor home. Back-in's only. Water and electricity, but no sewer. All sites are somewhat unlevel. Some have concrete. All sites are close to the small lake. Lots of overhanging trees that we had to maneuver around. NOTE: if you arrive a minute before the 2:00 PM check-in time, your code to get the gate open won't work, and you'll be stuck at the gate, either waiting for an attendant, who is not always at the shack, or another camper coming in. People were friendly. We camped at LeFleurs Bluff State Park in a Motorhome. Stayed here overnight escaping from hurricane. No sewer, very tight getting in the park, the first turn getting in was a bugger. Keep your code you will need it for the kiosk getting in and out. Nice sights, some dead trees need to be removed. Surprisingly great little campground in an urban area. Note: NO ATTENDANT on duty. 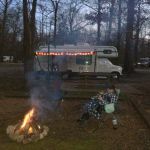 We camped at LeFleurs Bluff State Park in a Travel Trailer. First, the sites are very spacious. I loved being able to sit in my motorhome and see the lake, and I didn't feel like the other campers were right under my awnings. The 50 amp service and sewer both worked well. Dump station available near the park entrance. The park was well kept, and we enjoyed the hiking trails. The roads can use a bit of work, and there are some low tree limbs that rubbed across my roof as I drove to and from my site. Two cautions. First, you NEED a pressure regulator on your water. Don't ask how I know, just trust me on this. Second, there are at least two small alligators (about 5 foot) in the lake. Believe the "no swimming" signs. Fishing is another matter all together. Have fun with that. You will need your gate code that you receive when you register to enter or to leave the park. Still, for an urban state park, this is an excellent place to just kick back and enjoy nature. We camped at LeFleurs Bluff State Park in a Motorhome. 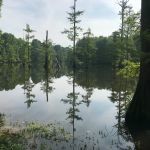 In addition to the park facilities, the Natchez Trace is very nearby. Also, if you have time, the Mississippi Petrified Forest is worth a few hours. There are 14 miles of hiking/biking trails that parallel the Natchez Trace in the area, all of which are nicely paved (though often in full sun). What a beautiful urban park: highly recommended. Lots of mature trees and serene lake views. We selected primitive site 1 but learned our rig was too big as the primitive sites are for tent campers. We moved to level lakefront site 19 with our 30' fifth wheel. Due to the park's very close location to interstate 55 road noise from early morning traffic was audible but not bad. We arrived after hours and the self check-in kiosk tablet gave us fits. Another camper helped us with it. The trick is to pay attention to all the required fields (with the asterisks) and remember the screen is not pressure sensitive. Just barely touch the screen with your fingertip. The camp is gated at both entrance and exit roads. The check-in process provides the five digit code you'll need (write it down) to get in and out. The code only works in this order: first at the entrance gate and then the exit gate. If you have someone following you the code will not work at the entrance gate twice in a row. The gate will not allow a second vehicle to closely follow the first. Good stuff to know! The bird watching was fine. 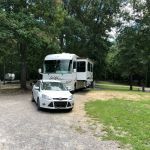 We camped at LeFleurs Bluff State Park in a Fifth Wheel. This campground was a pleasant surprise. I was not sure what to expect with the park in the middle of the city. We had a large, pretty site right on the river with electric and water. Could watch fish jump, white herons, and turtles sunning. The area is heavily wooded and scenic. Some sites are low to the river and prone to flooding. Can easily see why the showers and restroom building on stilts. There was a ramp and stairs to the building. Restrooms are not particularly clean. One stall evidently had a shower curtain for a door at one time but it was torn off. Didn't use bathroom or shower. It is a bit of the drive from the entrance station but easy to navigate. Need code to get both in and out. We definitely would stay again while in the Jackson area. We camped at LeFleurs Bluff State Park in a Motorhome. Civil rights museum is well worth seeing. It is very well done. Museum of Natural History, and Mississippi History Museum are also rather close. Note- Jackson roads could use a lot of work! It's quite possible this place blew my surge protector. Been Rving for 2 yrs and never had an issue with my surge protector until here. The protector reported issues on the 50 amp and said 1 of the lines was not working. I called the office and they didn't seem to care. Said no one was there to look at it and I could move if I wanted to. I decided to just use the 30 amp side and that as fine the rest of the week. Next place I ended up, my surge protector wasn't working. I had to go buy a new one. So take that with a grain of salt. The location to Jackson was great. The campground itself was very outdated. The women's bathroom has 3 stalls, 2 of which the doors don't work and 1 the toilet barely flushes. The shower pressure was great but the stalls were disgusting. Washing machines were out of order and about 20 yrs old. The lake was pretty and there was good hiking. There are a lot of permanent residents here but their sites and RVs were well kept so no issues there. Cell service was good. ATT and Verizon were both over 20mb d/l speeds without a booster. Didn't try T mobile. Good OTA channels. Dog friendly with good walking areas. Trash was not convenient. 1 dumpster at the front of the campground so that was a long walk if you were towards the back. This area gets swampy during rains so some sites on the lake get pretty wet. I would not stay here again simply because of the out dated conditions and the power issue. We camped at LeFleurs Bluff State Park in a Motorhome. We have stayed here several times. This time we were on the water on spot 11. It rained all week but the sun came out this afternoon and its great tonight. Just grilled hamburgers and sitting by the fire. We camped at LeFleurs Bluff State Park in a Motorhome. Great walking trails. Our dog loved it. I was on site 5 which worked well for us as our 40' MH was able to level up easily. Water pressure is very high so used a pressure regulator. The voltage was good, no sewer but a dumpsite on way out.. It rained all night but we stayed high and dry on elevated sight. Some sites near lake had big puddles surrounding their rvs. We did have to unhook our toad to get into the back in site and reconnected near the dumpster. There were a few limbs that needed to be trimmed along loop and in front of dumpster along the road. We managed to dodge these limbs to keep from scratching our rig. 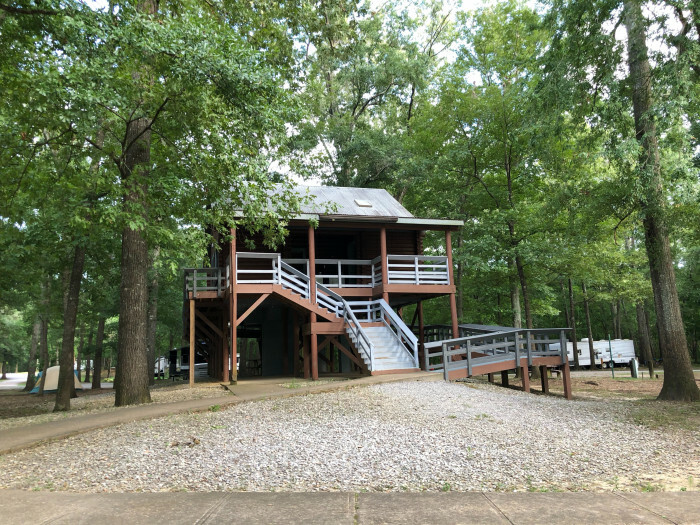 We did not use the bathrooms but if anyone is disabled and needs their restroom, this is not the park for you to camp, as the restrooms are on the second level accessible by stairs. These are elevated because when the river floods so does this park. We had a nice view of the lake even though we were not right on the lake. The SP ranger that signed us in was very nice and accommodating. This was our third time here and we would come back. Very handy to the interstate without the noise. We camped at LeFleurs Bluff State Park in a Motorhome. This park is close to downtown Jackson, which is one of it's most redeeming qualities. The road from the check-in kiosk to the campsite is chock full of potholes, so remove your toad shortly after getting through the gates. The sites have concrete pads for your rig, but they are really short. The front tires of our 29' motorhome were hanging off the front in the mud. Road through the park has a lot of old trees and is not the widest of roads. If you have a longer rig and don't feel comfortable driving through narrow corridors, this may not be the place for you. The restrooms looked clean and usable, if not outdated and a little on the dark side at night. Park rangers or "law enforcement" were constantly patrolling the campground. I'm not sure if they were looking for rule violations or trying to make the campers feel "safer". There was one washer and dryer available to use at the restroom (coin operated), but the dryer was broken for us. Park is close to major roads, but is far enough away where you don't get any of the road noise. A lot of folks catching bass and bream out of Lake Mayes, if that's your thing. We camped at LeFleurs Bluff State Park in a Motorhome. I loved this park. It's right in the city, so it's close to everything. But it's woodsy, so you feel like you're in the wilderness. Our site, power and water pressure were all fine. We didn't use the bathrooms. The garbage cans were a long way from our site, but I used the distance to walk ther dogs. We loved it here. 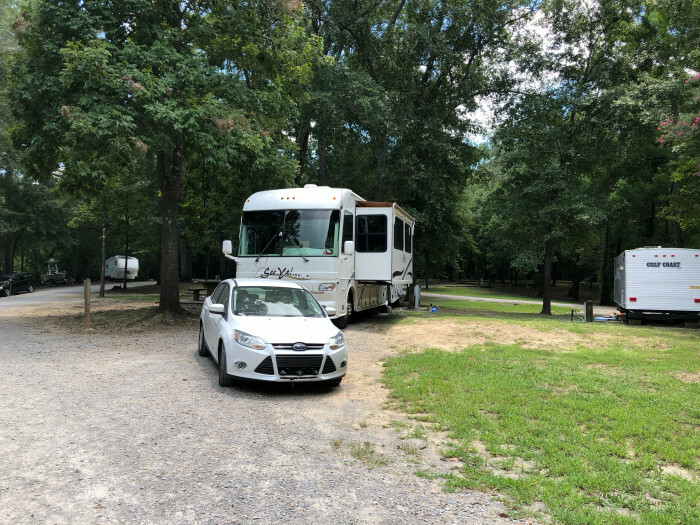 We camped at LeFleurs Bluff State Park in a Fifth Wheel. This was a stop over for the night on our way elsewhere...the park is easy to find and close to the interstate but in a very peaceful area that you hear very little noise...the sites are large and very shady and most sites have a good view of the lake with some sites that backup to the lake....showers were clean wth good hot water....our services worked good and we had good cell service and alot of over the air channels....this is a nice place to spend a few days if in the area...we'd stay here again if in the area or passing thru... We camped at LeFleurs Bluff State Park in a Motorhome. The state park is in a very urban area, just off of a very busy road and surrounded by busy freeways, so there is some substantial road noise in the campground. Getting to the park took a bit of doing. Realize that the campground area is separate from the other section of the park. Don't follow the main signs to the park, rather look for a campground symbol to direct you to the camping area off of Lakeside Drive (Highway 25). Use caution on the road leading up to the entrance gate, as there is a substantial hump that will send you swaying. Also the roads from the entrance gate to the campground are in really poor shape. 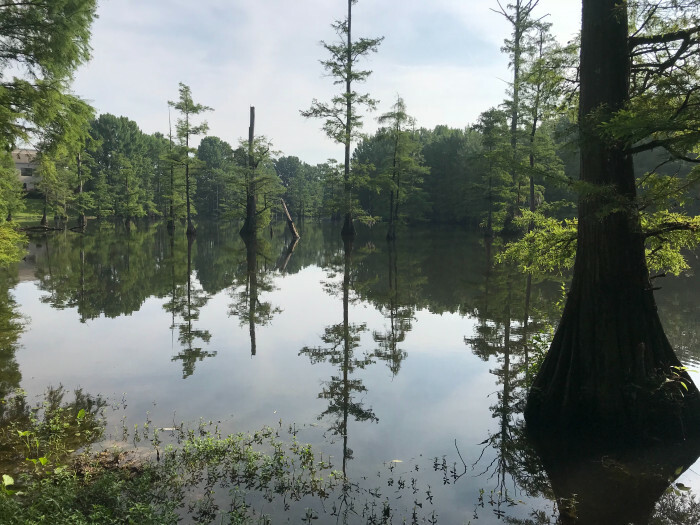 The campsites closest to the water on the outside of the loop are at a substantially low elevation, so stay pretty swampy. Getting hooked up required wading through mud. There were a number of sites that are clearly long-term with some pretty trashed trailers, not a pretty site. The site next to ours was pretty junked up with, apparently, two adult families living in a small RV. However, everyone we met in the campground was pleasant. The utilities were good and we had very strong Verizon voice and data. With a lot of work, we were able to find a hole in the trees to pick up DirecTV satellite with our portable dish. We certainly felt good about the security, you had to have a gate code to get into and, yes, out of the park. This made a good campground for exploring Jackson. We camped at LeFleurs Bluff State Park in a Motorhome. There is a lot to do in Jackson: Eudora Welty House, Medgar Evers Home (set up appointment), State Capital, Old Capitol Museum, Governor's Manson. Our only disappointment was the Museum of Art which was getting ready for a new opening and had everything closed. Excellent for sightseeing MS Sports Hall of Fame, MS Agriculture Museum, Luck Town Brewery (tours on Fri and Sat), MS Museum of Natural Science. The Mississippi Agricultural and Forestry Museum (and museum café) is right across the street. The entrance to the park is very narrow and tight, we have a 31 ft 5th wheel and it took us about 10min to get in the gate. Unless you want complete privacy I would recommend choosing a different sight number. Are you affiliated with LeFleurs Bluff State Park ?